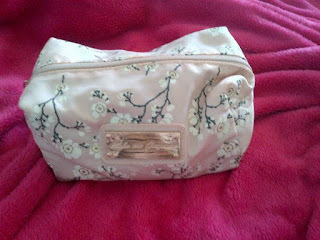 Emilyke: What's in my make up bag? So in my make up bag I have the make up I use every day/most days, the rest of my make up I don't use as much is in other places :) I actually have quite a few bits in my make up bag but I don't take it all in my handbag, I only take the lipstick i'm wearing and maybe eyeliner if i'm wearing it.. Lip products - No7 lipstick, E45 lip balm, MUA lipstick x2, Natural collection lipstick, e.l.f. 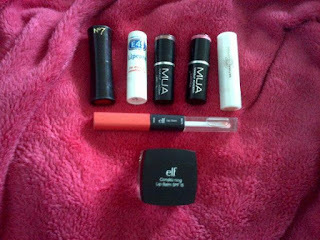 lip stain and gloss, e.l.f. condition lip balm. Recently been using the E45 lip balm if my lips are reaaally dry, if not so dry the e.l.f. lip balm, bad part of autumn/winter is having dry lips making my lipstick look scaly! I have somehow missed out my eyeliner! I have the Natural Collection eyeliner and also the Rimmel kohl eyeliner. 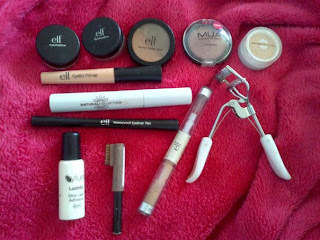 As you can see I only use high street/drug store products, working only part time I don't have the money to spend on high end products but drug store products are mainly still good quality and as you can probably tell i'm a big fan of e.l.f. 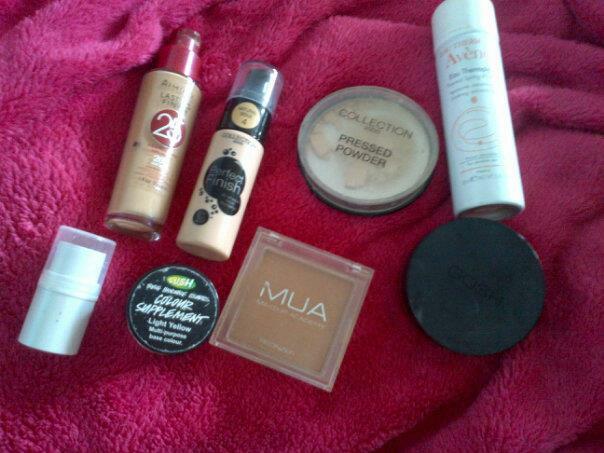 make up as it's such good quality for the price! When I go on a night out I always wear the same eyelashes as I love them so much, obviously I don't keep these in my make up bag, they are the Brit Rocks Lashes in Curvy which are just £1.99! I use the Eylure glue as I do think this is such an amazing glue and even though it's always in my clutch bag just in case I have to re-stick when i'm out, I never have to use it! 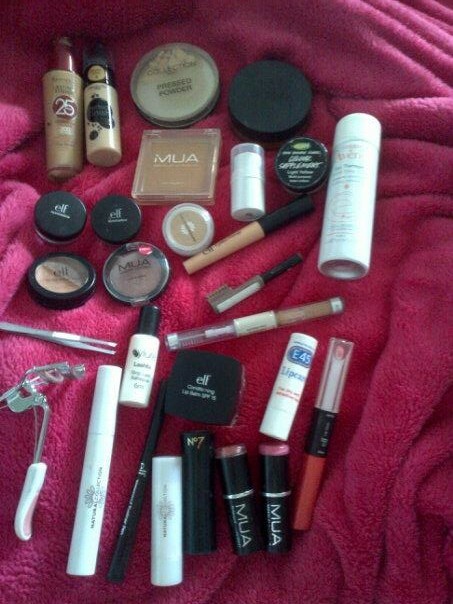 So those are the products I use the most on a daily basis, I apply them using brushes from Real Techniques and the e.l.f. studio or mineral brushes. My favourite brush ever is the Real Techniques buffing brush which I use for foundation and it is amazing! Hope you've all had a good start to your week and you can ask me any questions or whatever in the comments!